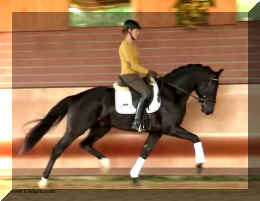 Bentley HW, black Rhineland gelding, by Boston/Quaterback, born in 2011, standing approximately 164 cm or 16.1 hands. Bentley HW, incredibly beautiful describes this wonderful horse. His sire is Boston, a stunning, elegant stallion, with exceptional movement and conformation combined with a very trainable attitude. He himself can look back at many victories and ribbons in the hands and training of Matthias Bouten and Isabell Werth. In addition, his foals collect gold and sell for top prices at auctions, including high price foals and more. Boston was champion stallion in England. After a fantastic 30 day test in Germany, he belongs now to the future hopes of dressage queen Isabelle Werth, she said: Boston is a stallion with outstanding attributes. He shows willingness to learn even the hardest tricks. His sire Jazz, is one of the most successful stallions of the current time and belongs to the Olympia team with Tinke Bartels. His son Parzival is Adelinde Cornelissen's team horse. Grand sire Cocktail, was internationally successful with Anky van Grunsven in the saddle. Bentley HW's dam SPS Quintera is by the Bundeschampion Quaterback. A stallion that seems like he could only come from another planet - with his light-footed, brilliant movement and perfect cadence, all eyes become riveted on Quaterback when he appears. 43 sons of Quaterback are already licensed, including the 2009 and 2010 young stallion champions in Neustadt/Dosse. 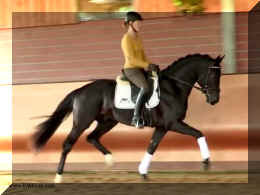 In addition, Quaterback has produced several premium stallions at almost all German licensings. SPS Quintera, Bentley HW's dam's dam is the famous SPS Reine Freude, she produced also the sensational, stallion of the century: Fidertanz. Fidertanz set early standards as NRW Champion Stallion, stallion performance test winner, Vice Bundeschampion, main premium winner and winner up to Inter I. A class of it's own! Fidertanz can only surpass himself - and so he did again impressively in 2013. As the only sire he presented even two Bundeschampions named Fürst Fohlenhof and QC Flamboyant. Just a few stallions have succeeded in doing this sensation in the past 40 years of history of these unofficial German Championships for young horses. Previously, Fidertanz presented three Olden-burg Champions (Fiderbach, Fantango and QC Flamboyant) as well as two mares in the Brillantring at the Elite Mare Show. The acclaimed NRW Champion Stallion set early standards: In 2005 he passed his 30-day test in Neustadt/D. and became Vice Bundeschampion in Warendorf (test rider score: 9.5). In 2006 he rose to be the Oldenburg Main Premium Winner with emphasis on dressage in recognition of his outstanding first foal crop. In 2007 Fidertanz round off his performance record with the qualifying for the Bundeschampionat. In the meantime, there are several placings up to Grand Prix level on his account.The beautiful Fidertanz inherits his great character and his extraordinary movements.Over 40 sons of Fidertanz are licensed, thereunder the Bundeschampion and Hanoverian Vice Champion Franziskus, the NRW Champion Stallion and Bundeschampionat competitor Flanagan as well as Feuerspiel, selling for 330,000 Euro as price highlight at the Verdener stallion market. Fürstentanz, Fiederhit OLD, Fiderstar and Fairytale placed in the finals of the Bundeschampionat. The last-mentioned Fairytale with his rider Isabel Bache have been selected to compete for the German team at the 2011' WC for five-year old dressage horses in Verden. One year later, this pair placed fourth at the Bundeschampionat.Also Fidertanz' daughters are a tribute to their father, especially the Oldenburg Champion Mare Fifty-Fifty, who was already Champion Mare at the German Foal Championship in Lienen and is now at Rothenberger's dressage stable for further training. Florencia became ZfdP Champion Mare, Fider's Tanzmarie and Fashion Girl were both 2. Reserve Champions in Münster-Handorf and Filipa K 2. Reserve Champion in Wickrath. The mare For your best was 1. Westphalian Reserve Champion and placed fifth at the Bundeschampionat. In 2013, Fantara reached with a group of the best ten the final ring at the German Elite Mare Championship.Fidertanz offspring reach top prices at auctions: The 2013' Hanoverian Champion Friemel went to customers from Brazil for a bit of 200,000 Euro. Firefox O was one of the price highlights in Vechta. More than 200 offspring of Fidertanz are successful in sport, a fact that placed their sire again among the best rideability sires of Germany according to FN's estimated breeding value statistic. They are attractive for their riding comfort and willingness to perform, whereby the first seven-year old ones reached effortlessly the advanced class. Fidertanz is a son of stallion performance test winner, Bundeschampion and Grand Prix winner Fidermark I, who unfortunately died far too early. The granddam Frühlingssonne produced the licensed stallions Disconto (by Divertimento) and Fanconi (by Fuchsberger). Performance line of Astfläche. Bentley HW is an extremely fancy gentleman. Beauty, elasticity, and suspension outline this stunning creature. Three rhythmic, big, expressive gaits - that will blow any and all competition out of the park. He is fabulous to ride. Super nice to sit and light in the bridle he is the horse we all wish we had! Bentley HW, equipped with phenomenal competition genes, is a horse of unbelievable quality and super fancy mover who knows to impress due to his type, movement and work ethic. This stunning horse has it all. He has a super nice, chiseled head, big stallion neck (he's a gelding! ), if he blinks with his beautiful kind eye, you'll fall in love at first sight. He is a dream come true. This horse has cat like movement, he's as elastic as they get. His hooves barley touch the ground. He loves to please his handler and rider and is a fast learner. He eagerly works under saddle and loves his job. He is breathtaking to watch in the dressage arena and with his quick, far reaching hind leg, passage and piaffe will come naturally to him. He is supple and has a ton of air time. He just floats above the ground. With his free shoulder and huge grundschwung, he swings nicely through his back. This extremely talented gentleman has international potential. He is a very sweet boy with great ride ability and he makes a lasting impression on whom ever sees him. He is easy to handle and loves his personal grooming time and puts his head right in your lap, striving for attention and searching for treats. Perfect Junior or Amateur's horse and absolutely fancy enough and the right quality for a professional as well! You just can't beat his personality, gaits, looks and temperament. With this horse, you will be the star in FEI classes and at clinics, the judges and onlookers will remember him where ever he goes. His bloodlines are very much sought after and he's definitely one for the big ring. This boy will go far in the dressage ring, he is your ticket to the top! He is used to go in the hot walker, loves his shower and solarium time. Stands for the farrier, loads and appreciates grooming time. He's an über cool horse - all you looked for and more!